A lot going on behind-the-scenes at Thirdwalling! For starters, things got really official with the registration of http://www.thirdwalling.com! We’re still hosted on WordPress (for now) but we’re all pretty excited about the URL. A few of us are working on some new series that will hopefully help new Game Masters create their first games, as well as scheming with the head of the local chapter of O.G.R.E.s on a DM101 class for the local game shop. It has been a busy time of Birthdays and Geek stuff! A few of us on the Thirdwalling crew have started playing X-Wing Miniatures on weekends, so look for some painting tips and tutorials soon on that as well! This weekend the Thirdwalling crew is hitting up GMX in Nashville, Tennessee! It looks like most of us will be moseying around most of the day on Saturday checking out panels and buying swag. You can check out the full scheduled on their website! Today is a very special day! Five years ago today, The Ginger made an honest man outta this old Star Wars nerd. Happy Anniversary, Princess. I love you! What’s in a name? As said by Shakespeare’s Juliet “A rose by any other name would smell as sweet.” And while our star-crossed lovers may still have quaffed their apothecary’s brew, I doubt audiences would be as eager to attend “Garth and Janet” as they are “Romeo and Juliet”. But what can we do to improve our characters’ names? Whether creating the next big villain or simply adding some good back-story flair to that goblin the party just decided to interrogate, creating a name for your non-player characters (NPCs) can set the scene as well as any physical description. I picked one of these up at Party City a few weeks back and never really did anything with it. This past weekend I got a bit creative with some craft paint, some cardboard and some paper towels to make some mounts for my D6 Fantasy game. Horses for the humans and elves, and a wolf (made from the dog model in the pack) for some goblin and halfling NPCs. 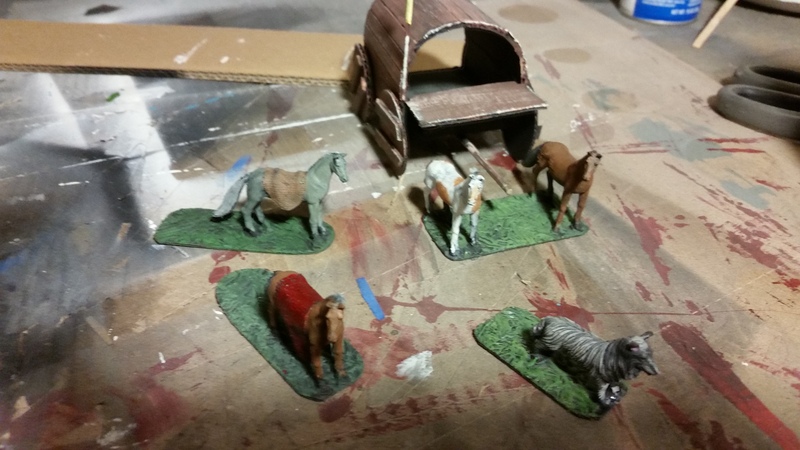 Some horses and a dog mount for my D6 Fantasy game. Last week, we examined some guidelines to using dice towers. In that article, we made the recommendation that users make their own towers rather than springing for the available store bought. While there are quite a few great plans out on a simple web search for making these simple gadgets, once again we will put our money (all $2.00 of it) where our mouths are and show how to create a custom dice tower. This step-by-step tutorial shows how to lay them out and glue them up, and offers suggestions for improving our simple design!